When a wily, witty, lazy, cheating slave discovers that his master's son is in love with the girl-next-door - a virgin courtesan - he promises to help win her heart in exchange for his freedom. But the road to romance is blocked with stunning surprises, cunning disguises - and the wildest chariot race ever! Oftentimes, a movie's title alone can set up certain expectations. For instance, if I'm sitting down to watch a comedy called 'A Funny Thing Happened on the Way to the Forum,' then I'm probably going to expect, you know, something funny to happen on the way to the forum. Thankfully, something funny does indeed happen. In fact, lots of funny things happen… along with singing and dancing! A high-energy musical farce from director Richard Lester ('A Hard Day's Night'), the film offers an amusing blend of slapstick charm and goofy satire -- and all at the hands of a legendary comedic ensemble dressed in brightly colored togas! 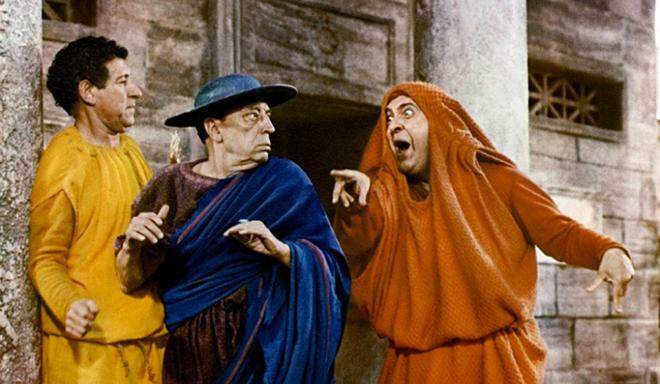 Based on Steven Sondheim's stage musical of the same name, the story focuses on a scheming but sluggish ancient Roman slave named Pseudolus (Zero Mostel). When his master's son, Hero (Michael Crawford), begs for help in order to win the heart of a courtesan (Annette Andre), Pseudolus accepts the challenge in return for his freedom. But as the situation grows increasingly complex (and dangerous), the clever slave soon finds himself in over his head. Led by the great Zero Mostel, the cast is absolutely brimming with delightful personality, and the ensemble plays off of one another brilliantly. Mostel is particularly hilarious as the cheating, crafty Pseudolus, playing up every new devious plan with wily glee. 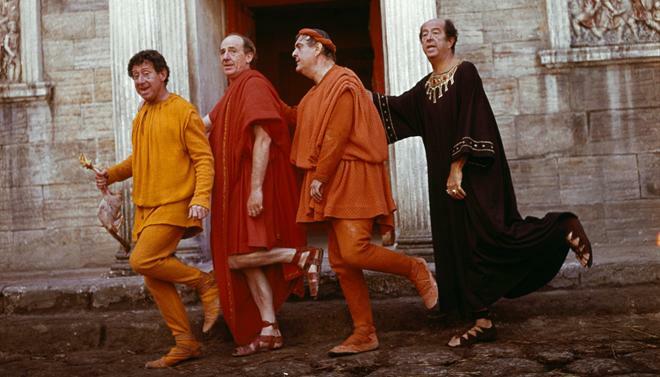 Likewise, Phil Silvers, Jack Gilford, and Michael Hordern are equally entertaining, and together they all bring a sharp contemporary comedic sensibility to the ancient Rome setting. Special note must also go to Buster Keaton who delivers a very memorable final screen role. Despite battling cancer at the time of shooting, the celebrated comedian still pulls off many of his own stunts, offering a few inspired bits of slapstick. In addition to the film's physical sense of humor, much of the comedy also comes from farcical observations, light social satire, witty wordplay, and a few gags that involve silly reversals of expectation. For instance, one scene involves a character tossing a bird with a message to a nearby window… only for the bird to abruptly fall down toward the ground instead. Director Richard Lester does a fantastic job of building up all of these numerous aspects, and as the plot becomes more and more intricate, the various moving pieces collide in a rather inspired explosion of comical chaos. To this end, Lester brings his usual penchant for playful cinematic style to the screen, enhancing the runtime with some fun visual touches. Quick edits, zooms, and jump cuts are used occasionally to ramp up the energy and pace, including one particularly effective rapid-fire montage that sums up the film's many intersecting plotlines. The spectacular chariot race that marks the story's climax proves to be very exciting as well, and even features some classic fast motion antics that hark back to the silent era. Of course, the real stylistic highlights of the movie come during the periodic music and dance numbers, and these scenes are all gloriously goofy. The choreography is especially silly, resulting in some hilarious dance moves from the cast that poke fun at the type of overly dramatic romance one usually associates with the genre. And these visual bits are all bolstered by clever and spirited lyrics. Also, it certainly doesn't hurt that the melodies are pretty damn catchy as well, making it all the more fun to hum along to the absurd sight of Zero Mostel frolicking around with Jack Gilford in drag. The opening number to 'A Funny Thing Happened on the Way to the Forum' promises a "Comedy Tonight," and the filmmakers successfully live up to that pledge -- providing a healthy helping of farcical entertainment. The musical might not be a true classic, but it holds up very well and features a delightful ensemble. Lester manages the script's gradually building sense of hilarious disarray perfectly, leading to an entertaining, mad-cap climax that can only be described as "lovely, absolutely lovely." Kino brings 'A Funny Thing Happened on the Way to the Forum' to Blu-ray on a single BD-25 disc that comes housed in a keepcase. After some logos and warnings, the disc transitions to a standard menu screen. The packaging indicates that the release is region A coded. The movie is provided with a 1080p/AVC MPEG-4 transfer in the 1.85:1 aspect ratio. Though a little uneven at times, this is a seemingly authentic and mostly pleasing image. The source print is in pretty good shape with only some minor scratches, specks, and dirt visible from time to time. A moderate to heavy layer of grain is also apparent throughout, giving the picture some natural filmic texture. With that said, some shots do look a tad rougher than others (especially the climax) and the transfer does have a predominately flat quality. Overall clarity is good, highlighting every line of devious personality in Mostel's expressive face. While a little faded, the color palette is also pleasing, offering decent pop in some of the costumes and sets with punchy reds, oranges, purples and yellows. Contrast is well balanced, but blacks are just a hair elevated. Digital artifacts are mostly absent, but some faint halos are present in a few shots. Despite some minor inconsistencies, this is a respectful and relatively sharp transfer. The film is presented with an English DTS-HD MA 2.0 track along with English subtitles. Free from any age-related hiccups, this is a surprisingly engaging mix that does a good job of bringing the movie's musical numbers to life. Dialogue is clean and clear throughout, though speech is a little on the flat side. Vocals, on the other hand, feature a nice, full quality. The musical numbers all come through with pleasing fidelity and separation, offering strong range. Likewise, there is some decent directionality with voices and effects in the two channel presentation as well. With that said, the transition to the songs can be a little jarring, as the sound quality jumps up a bit during the musical scenes. Thankfully, there are no pops, crackles, or hisses to report. Considering its age, the mix is quite effective and the songs sound great, giving every playful lyric ample presence. Theatrical Trailer (HD, 2 min) - The film's trailer is included in 1080p with DTS-HD MA 2.0 sound. 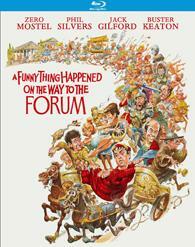 'A Funny Thing Happened on the Way to the Forum' is a playful and entertaining musical comedy from director Richard Lester. The cast is fantastic, pulling off a funny mix of slapstick farce and silly wordplay. On the technical front, the video transfer is very solid and the audio mix is strong. Unfortunately, the only extra we get is a trailer. While not exactly a comedy classic, this is an enjoyable film that has aged surprisingly well. Worth a look.